Transition Town Milton Keynes: Permaculture Workshop - 22nd April - Book your space now! Permaculture Workshop - 22nd April - Book your space now! 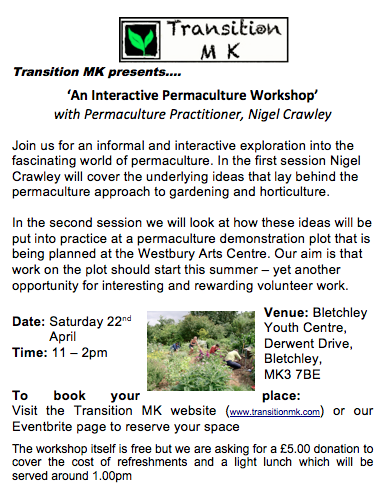 Transition MK invites you to an interactive permaculture workshop on Saturday 22nd April, from 11 - 2pm. This workshop will cover the underlying ideas that lay behind the permaculture approach. We will also look at how these ideas will be put into place at the permaculture plot being planned at Westbury Arts Centre in Shenley Wood, Milton Keynes. To book your space please visit our eventbrite page. The workshop itself is free but we ask for £5 donation to cover the cost of refreshments and light lunch which we will provide.